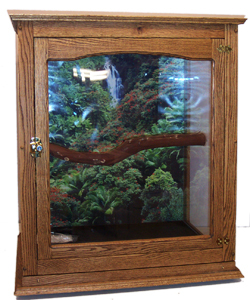 Our cabinet style and plastic style bird cages are built with oak and polycarbonate. All of our bird cages come with manzanita perches, 2-Lixit Bowls, debris tray, and castors. 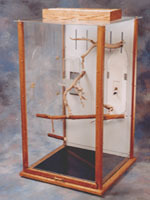 Climbing walls are included on specific cages. To find out just ask at the time of your order. All cabinet style bird cages come with 1/2 x 1/2'' stainless steel wire top, stainless steel wire climbing wall is extra.